A Mastermind is the development, through harmonious cooperation, where two or more people gather themselves, for the purpose of accomplishing any given task. The two key words here are cooperation and harmonious. To form a successful Mastermind, there needs to be a common purpose, and like minds operating on the same frequency of thought power. When this alliance is created, anything is possible. Access to universal intelligence is available for the benefit of that Mastermind. It is a mind chemistry that blends together, forming substance out of the ether. This is why it is so important as to who you associate with. Birds of a feather flock together. You become who you associate with. If you want to achieve great success, surround yourself with successful people. 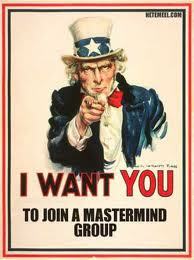 Form a Mastermind group, and see for yourself how this great power will assist you in your endeavors. When you align yourself to the ultimate Mastermind, everything and anything is yours for the asking. This entry was posted on Tuesday, August 20th, 2013 at 2:08 pm and is filed under Mastermind Groups. You can follow any responses to this entry through the RSS 2.0 feed. You can leave a response, or trackback from your own site.